"My works are like water. The works of the great masters are like wine. But everyone drinks water." You will receive information by e-mail about posting to the list and customizing your subscription options shortly after you subscribe. For a printable instruction sheet in PDF format on how to subscribe (requires Acrobat Reader), click here. For further information on setting subscription options, please read the instructions in the Survival Guide or contact the list administrator for assistance. 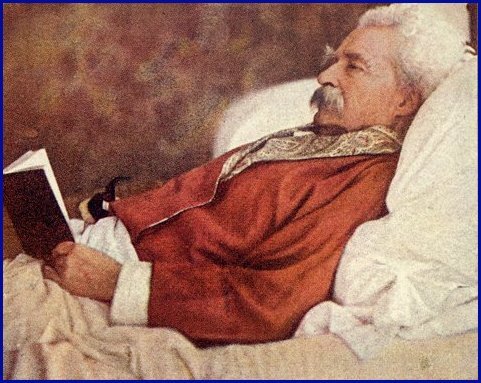 Note to students: Please visit About Mark Twain and read the "Suggestions for Researchers" section of the Survival Guide before sending questions to the Mark Twain Forum or to the TwainWeb editors. Questions about Mark Twain, his writings, the sources of quotations, help with papers for school, etc., should be answered at the library; the best source of information about Mark Twain is still the library, not the Web. Content Copyright © 1992-2015 Mark Twain Forum. All rights reserved.